In an age where secrets are pretty hard to keep, 10 Cloverfield Lane snuck right under the radar. Industry watchers didn’t think too much of the indie mystery thriller called “The Cellar” starring Winstead and Goodman, but once the connection to the 2008 found footage monster movie Cloverfield was revealed, everyone’s attention was grabbed. Winstead plays Michelle, a woman who is caught in a car accident and awakes trapped in the bunker of a stranger called Howard (Goodman). Howard claims that the outside world has been thoroughly contaminated in the wake of an unknown catastrophe, and that the occupants of the bunker are the only ones left alive. The third person in the shelter is Emmett (Gallagher), another survivor of the attack. Michelle is understandably suspicious of Howard, and she has to determine whether he’s captor or saviour as she tries to put the pieces together. 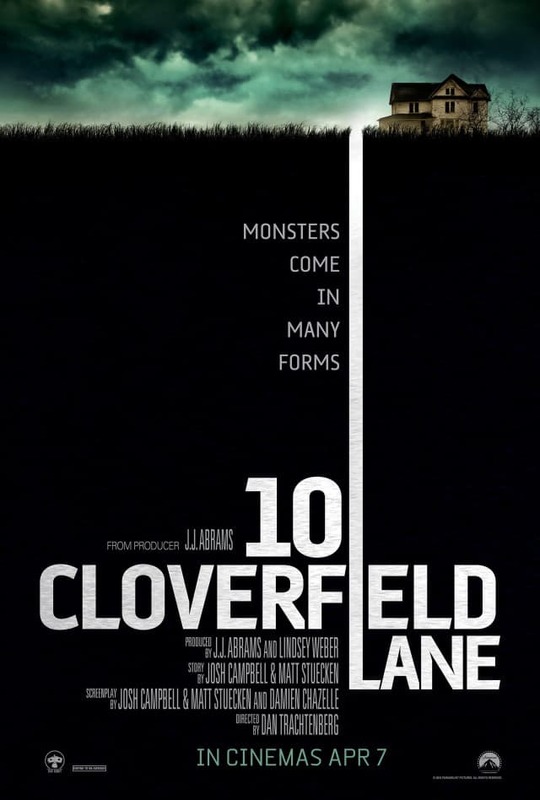 The original Cloverfield is one of the biggest victims of “director displacement” ever – Matt Reeves helmed the film, but it is most strongly linked with co-writer and producer J.J. Abrams, who also returns to produce 10 Cloverfield Lane under his Bad Robot production company. The Bad Robot offices contain Abrams’ extensive collection of Twilight Zone memorabilia, the classic television series being Abrams’ favourite show and an enduring influence on the filmmaker. 10 Cloverfield Lane does play like a Twilight Zone episode, with a corker of a mystery unfolding in claustrophobic confines, the protagonist plonked into the middle of a situation that appears to make no sense. The influence of Orson Welles’ iconic War of the Worlds radio broadcast is also felt. The film marks the feature directorial debut of Dan Trachtenberg, who garnered attention for his fan film Portal: No Escape, based on the popular video games from Valve. 10 Cloverfield Lane has its origins in a spec script written by Josh Campbell and Matt Stuecken, and originally had no ties to Cloverfield. When the script was picked up by Bad Robot, Abrams brought on Damien Chazelle to rewrite the script as a “spiritual sequel” to Cloverfield and to direct; he dropped out of directing after his film Whiplash was given the go-ahead. Of all the directions the much-demanded follow-up to Cloverfield could’ve gone in, it’s safe to say nobody saw this take coming. Now, all this does sound confusing and the more cynical among us will arrive at the conclusion that the Cloverfield brand has been slapped onto this to boost this film’s visibility and lay the groundwork for a franchise. Rest assured that the connections to Cloverfield are quite subtle and one doesn’t have to be well-versed in the myriad fan theories to enjoy 10 Cloverfield Lane. According to Trachtenberg, this doesn’t even take place in the same fictional universe as Cloverfield, but the connections are there if you’re keeping your eyes peeled for them, and the possibility that the two films could be linked up in a future instalment remains. Hitching this film to a successful predecessor in no way detracts from its artistry. The storytelling is efficient and taut, Trachtenberg sustaining tension with a real master’s touch. This could almost be a stage play, taking place in just a few rooms, but the end result is distinctly cinematic. Production designer Ramsey Avery’s bunker set has to be at once foreign and intimidating but also feel enough like home. Until Michelle gets a handle on the situation, she can never truly be at ease, and neither can the audience. Information is parcelled out in just the right amounts and the narrative rug-pulls occur in such a way as to not feel cheap or manipulative. A non-diegetic score was a luxury the found-footage Cloverfield did not possess. While Bear McCreary’s soundtrack does fall back on clichés like the use of “Psycho strings”, it is an effective factor in ratcheting up the pit-in-your-stomach sense of dread present throughout most of the film. The film’s small cast work remarkably off of each other, the push and pull amongst the three of them never letting up as the story progresses. Winstead’s Michelle is terrified, and who wouldn’t be, but also has the presence of mind to be exceedingly resourceful, analytical and clear-headed in the face of danger and uncertainty. Goodman often exudes a friendly warmth, but he does have significant range as an actor and Howard’s ambiguity is something Goodman excels at playing. He has an imposing presence and the doomsday prepper always feels in charge, the king of this small, subterranean domain – and not necessarily a benevolent king. Gallagher comes off as an essential presence in the piece as opposed to a third wheel, Emmett’s apparent good nature easing the tension when it’s required. There are many thrillers that stage an intriguing, engrossing build-up, only to squander the audience’s investment in the story with an unsatisfying payoff. While 10 Cloverfield Lane’s conclusion might not please all viewers, it’s a finale that this reviewer feels it has really earned. Regrettably, said ending is spoiled in the theatrical poster used in certain territories, including Singapore. Is it entirely necessary for the Cloverfield connection to exist? Perhaps not; it seems the film would work just as well on its own. However, the buzz that has built up around the project due to Abrams’ link to it has given it a wider audience than the film would’ve had otherwise. Summary: A masterfully constructed nail-biter, 10 Cloverfield Lane is a self-contained mystery thriller that is engagingly performed and thoroughly engrossing.